Nestled on a U bend on the Adige River, Verona is one of the most important cities in the Veneto region of Italy and is famed for its historical centre and myriad of stunning buildings and architecture. Verona is the second largest city in the region behind Venice and has a population of 269,000. In 89 BC, Verona became a Roman settlement and held an important position in Northern Italy as it was located at the intersection of two important roads. As time progressed and the Roman Empire collapsed, other factions and ruling parties exercised control over Verona including Alboin of the Lombards, Mastino II, and Maximilian I. Today, Verona attracts a huge number of tourist due to its rich history and significance, and its myriad of ancient buildings such as the Arena and the Ponte Scaligero. Forget about the Colosseum in Rome; Verona has its own version that is just as spectacular and possibly better preserved. This national landmark is unknown to many, but it stands as a triumph of Roman engineering and is a true wonder. Located in the middle of the historic town centre, the Arena is an immense Colosseum that contains literally of its original seating and exterior arches. Constructed in 30 AD, it is remarkable that this structure has stood in such a fine condition for thousands of years. Various shows and games would have been held here such as the Roman Ludi and at its peak, the amphitheatre would have held 30,000 spectators. Today you can walk inside the Arena and admire its architecture; furthermore, concerts and musical shows are still held here which is a true spectacle. Sitting on the banks of the River Adige, the Castle Vecchio is a hugely important structure and has stood since its initial construction in 1354. Serving as a primary mode of defence for the city, this castle was the greatest achievement of engineering for the Scaliger dynasty. The front gatehouse of the castle is quit imposing and features a series of crenulated battlements and two guard towers. Inside there is a museum dedicated to the history of the castle that contains a myriad of artefacts and factual displays. 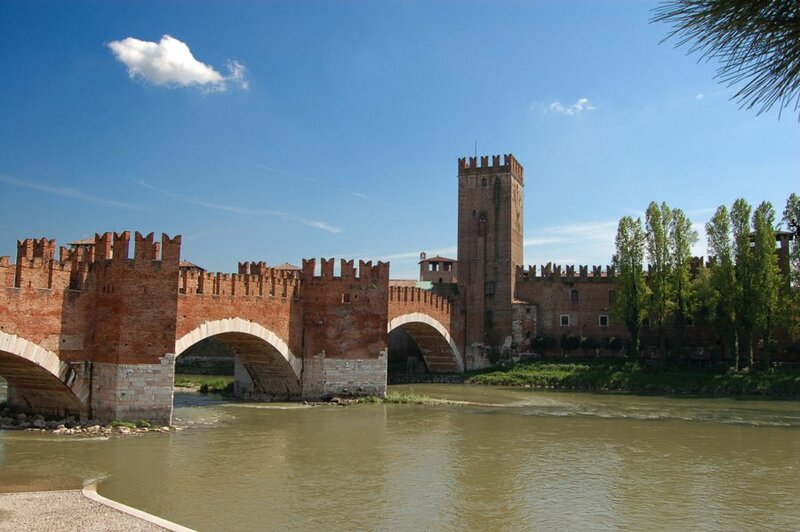 Furthermore, there is the fantastic Castle Vecchio Bridge that is attached to the main complex and provides fantastic views down the river. At the time of its construction, the bridge was the longest of its kind in the world. Connected to the Castle Vecchio, the bridge is decorated in the same style as the walls of the castle and features a fantastic series of crenulated battlements that you can see through down the River Adige. As with most of the historic buildings of Verona created during this era, the bridge is made from red brick which makes it stand out against the landscape of the city. Furthermore, there is several series of stairs that you can climb in the towers of the bridge to gain an elevated viewpoint. Aside from walking across the bridge, ensure that you walk along the river bank to view it and photography it from the side. The Basilica of San Zeno is one of the most important religious buildings in Verona, mainly for its stunning architecture, but also because it was the fictional place of the marriage of Shakespeare’s Romeo and Juliet. 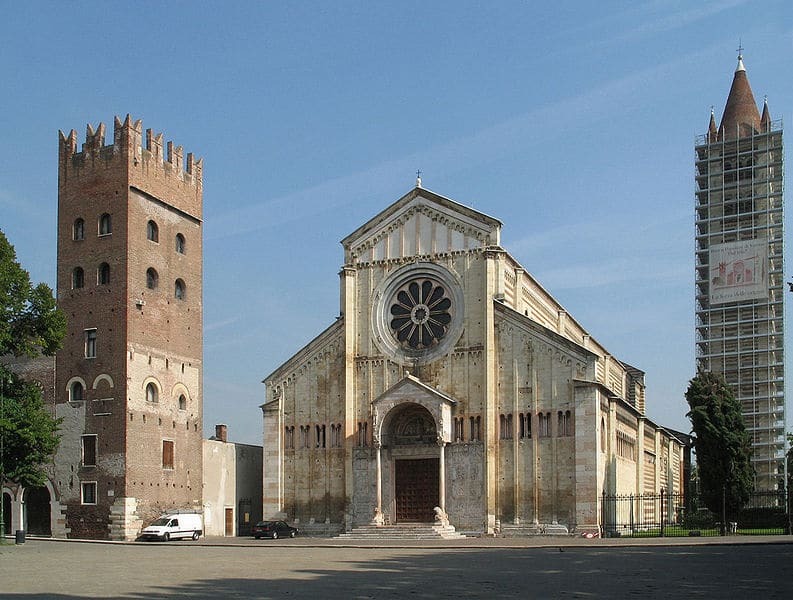 Located on the west side of the River Adige, the Basilica sits at the far end of the Piazza San Zeno. The front façade of this church is quite simple and has a large central circular window and a beautiful ornate wooden door. Inside the Basilica is truly beautiful however – the floor is covered with peach and grey tiles, marble columns hold up the arches and the ceiling has a series of decorative tile-work. Additionally, an Abbey is also attached to the church with a wonderful arched courtyard and cloister. Verona has a wonderful amount of charming squares and the Piazza Delle Erbe is one of the finest examples. This diamond shaped piazza lies in the heart of the historic centre of the city and serves as one of the main points of activity. During the Roman Empire, this piazza would have served as the main forum for the settlement. Various important buildings line the square including the Torre Lamberti, the Palazzo Maffeia and the Case dei Giudici. Furthermore, there is a selection of cafes and restaurants and also several fountains and marble statues. The architecture, building facades and character of this beautiful piazza is undeniable. The Giusti Gardens are located in the grounds of the palace of the same name on the eastern bank of the river Adige. The palace itself is a Neo-Classical structure and the gardens can be found at the back of the building. Designed in an Italian Renaissance style, the gardens are some of the finest in Verona and provide a beautiful contrast to the waves of architecture that is present in the city. Separated into 8 different squares, each part contains a different design and a central fountain or decoration. Maintained to a beautiful standard, it is easy to see the care and attention that is put into this garden. Furthermore, there is also an exciting hedge maze and a small wooded area to walk through. As the largest piazza in Verona, the Piazza Bra is one of the main tourist areas of the city and contains a great amount of historic buildings, public amenities and eateries. Undoubtedly the main attraction of the piazza is the colossal Arena di Verona and the open space surrounding this monument offers some fantastic photographic opportunities. Furthermore, there is the Gran Guardia and the Palazzo Beriberi which are two fabulous buildings in their own right. Aside from the main buildings, there are many quaint shopping and residential structures that are painted in various colour and have beautifully decorated shutters and balconies. The Piazza Bra is definitely one of the best places to start your tour of Verona. Standing proudly on the Piazza Delle Erbe, the Torre dei Lamberti is the tallest tower in Verona standing at 84m high. Construction originally started in the 1100’s however the tower stood in a state of disrepair and it was not until the 15th century that the tower was enlarged and clad. Different time periods can be seen when looking at the tower as it is split into several distinct different sections. A huge clock face adorns the wall that faces into the piazza, and the tower is topped with an octagonal dome containing a series of marble arches. If you want to see Verona from a different angle, you can climb to the top of the tower and see the whole of the city spread out before you. Created in a similar style to the Basilica of San Zeno, Verona Cathedral presents a building that is grander, larger and more decorative. The front facade features a similar shape and composition, but contains a great deal more decoration and some fantastic artwork and stained glass windows. Consecrated in 1187, the Cathedral is one of the oldest religious buildings in Verona and is dedicated to the Virgin Mary. Whilst the exterior is marvellous in its own right, the interior is just as opulent and decorative. At the main altar, there is a stunning fresco depicting the a religious scene, and more Renaissance frescos can be seen in the main chapels. Furthermore, a huge gold organ stands to the right of the altar and red Verona marble columns line the main knave. Holding a strategic position on the eastern bank of the Adige, the Castle of Saint Peter sits on a slightly elevated hill and has been inhabited since Roman times. Originally, a church dedicated to Saint Peter stood here which gives the castle its name. During the 1300’s the actual castle was built as a means of fortification for the city and stood firm for over 400 years. 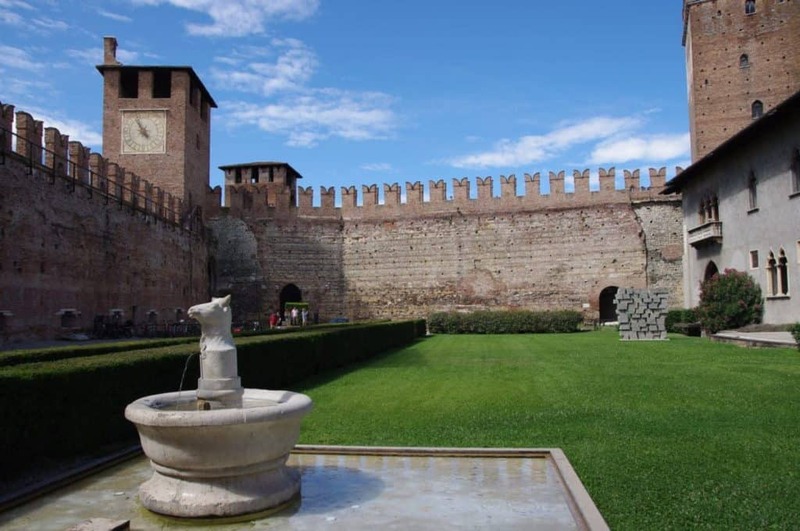 Although the castle is no longer open to the public, you can still walk through its grounds, admire the amazing architecture, and experience fantastic views across to the historic centre of Verona. Located next to the Piazza dei Signori, the Scaliger Tombs are a series of gothic funerary monuments dedicated to the influential Scaliger family. This family rule Verona for many years and the heads of the house sat as the Lords of Verona. Enclosed within a series or ornate Iron grills, the tombs have a Gothic design and feature a central arched structure with many pointed towers and stone sculptured decoration. Five tombs in total sit in the enclosure dedicated to Cangrande I, Mastino II, Cansignorio, Alberto II and Giovanni. The last monument is actually built into the wall of the adjoining chapel and features an ornate coffin and death mask. Reminiscent of the Arch of Constantine in Rome, the Arco dei Gavi was constructed during the first century AD and would have originally served as part of the city defences and been a major gate into what is now the historic city centre. The original inscription of the pediment on the arch read “Lucius Vitruvius Libertus”. During the Napoleonic era, the arch was actually demolished and it was not properly rebuilt using original designs until the 20th century. You can now marvel at the arch in all its glory next to the Castle Vecchio – It is also worth seeing at night when it is beautifully lit up. Verona is famous for having an associated with William Shakespeare; several of his plays are set in this city including the epic Romeo and Juliet. Located on the Via Cappello, the Casa di Giulietta is the supposed building from the famous scene in Shakespeare’s play where Romeo Hails Juliet and she speaks to him from the balcony. Although this building has been added too and any truth has be embellished, it nonetheless provides an important attraction and is a great place to visit if you are in that part of the city. You can see the fabled balcony and inside the house there is a selection of informative displays about the play and the building. There are many great lakes in Italy, but non is as impressive as the mighty Lake Garda. Lake Garda covers a surface area of 369 squared KM and has a water volume of 50.35km cubed. It is one of the largest lakes in Italy, and also a popular holiday location due to its favourable climate, beautiful scenery and the amount of attractions available. 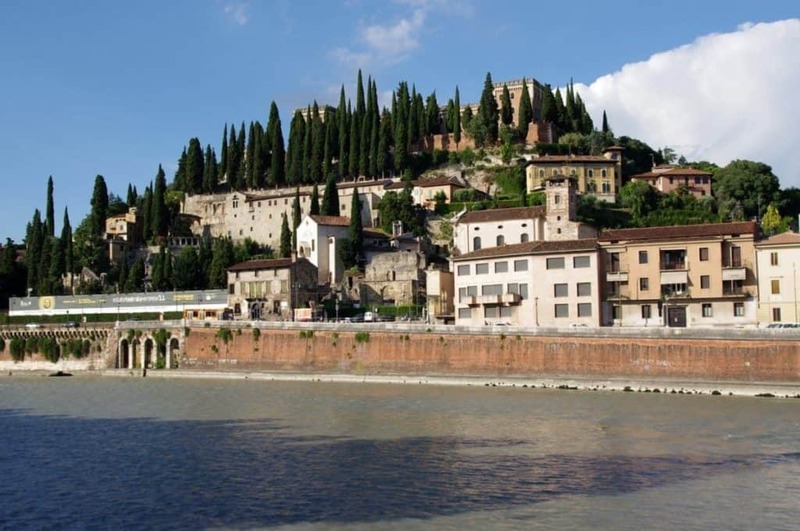 If you are staying in Verona for a length of time, consider taking a day trip to Lake Garda to explore this beautiful area of natural beauty – Consider a boat ride on the lake, or visiting one of the charming towns that sit on its shores such as Sermione or Bardolino. Another of Verona’s fine Piazza’s, the Piazza dei Signori actually sits in close proximity to the Piazza delle Erbe but is just as interesting and popular. Many historical and architecturally beautiful buildings line the square including the Palazzo del Capitano, the Loggia del Consiglio and the Case della Pieta. Each building offers a slightly different style and the square is a miss-match of different time periods that creates a pleasant contrast. Music performances are often held here and there is also several cafes and restaurants with outdoor seating.